Show us your binding rot. I’m sure there is a joke in there somewhere, LOL. This is the rot on my Country Club. Show us your binding rot. Captain when you get a chance please post those pics. Love to compare binding rot. 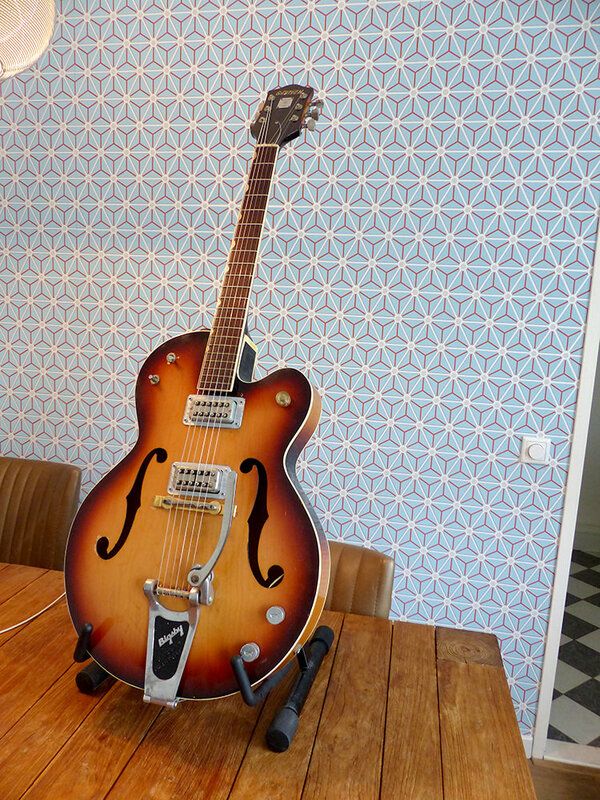 Love your comment on bookmarking for future reference when you are tempted to buy a vintage Gretsch. I mean it sarcastically/humorously because I'm currently GASing for a 64-67 Gent. But seeing those pictures did remind me of some of the work I had to do, and never did, on my previous vintage Gretches. captain lol I get it now! I haven't got any. I've never had one develop it in my possession, and I've always steered clear of it. I wouldn't have any issue with a guitar that's been rebound if it's done right, or getting one rebound if it was the right guitar at the right price. It's just not been an issue for me thus far (knocks on wood). You beat me to it Afire. 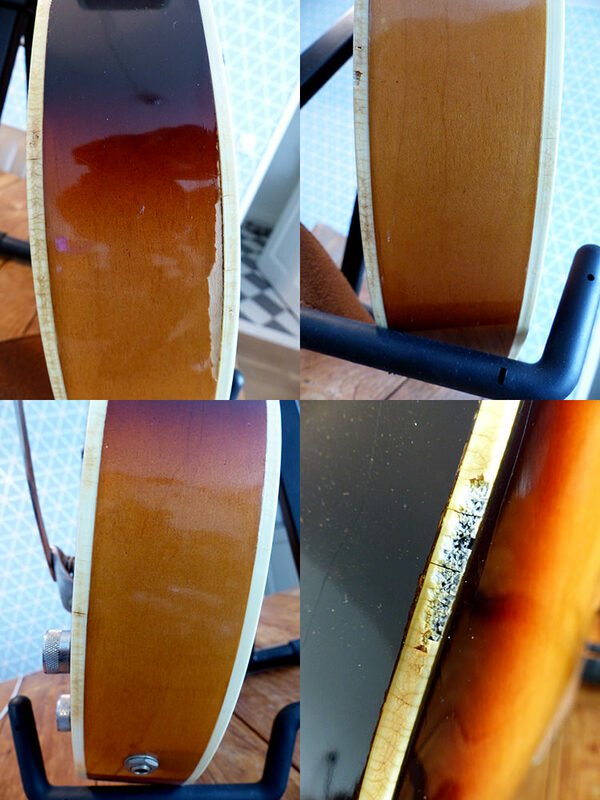 I have to report no evidence of rot on any of the guitars in my 10 guitar stable and mine span the '40's thru the '90's. 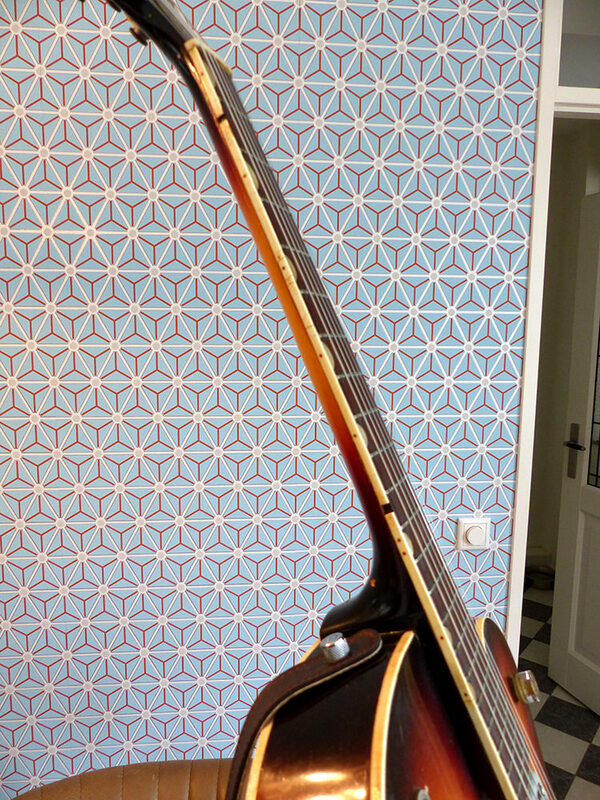 I had a 6070 bass that might have won the binding rot prize. But most thing it's worst in the early Baldwin era --late 60s. Not too many from the Baldwin era either lx, but here I'm referencing beginning in '72 onward, when the visual changes came along - the Burn's Box truss rod, pickguard shape and pup covers. Gold hardware on that sunburst looks niiiiccce! My '68 6119 is in our new house in TX. If this thread is still going, I'll take a picture of it when I'm there in a couple of week. It has superb binding rot. Mark, please post pics when you can. We would love to see it. Thanks. 1967 Monkees I had for a little while. It would take me a fair few posts to show it all. knaval, that’s nice. Thanks for posting. Please post more. 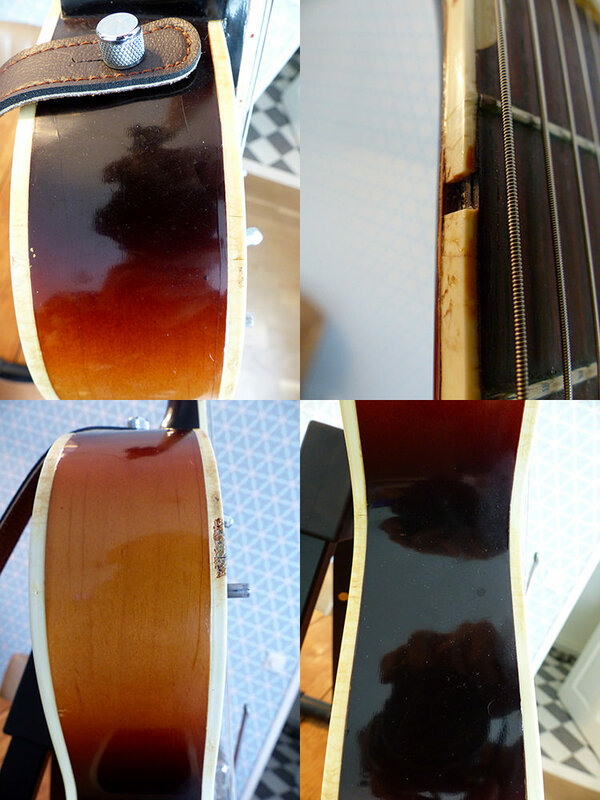 Fortunately for my guitar although there is lots of binding rot it still is very functional. My 65/66 6120 just started 4 years ago ,not too bad, some small signs of staining, shrinkage and small cracks,the smell though when i took it out of the case after a year in storage was awful,thankfully it isn't too bad now that it hasn't seen it's case in those 4 years.No photos though,sorry ,camera is banjaxed . 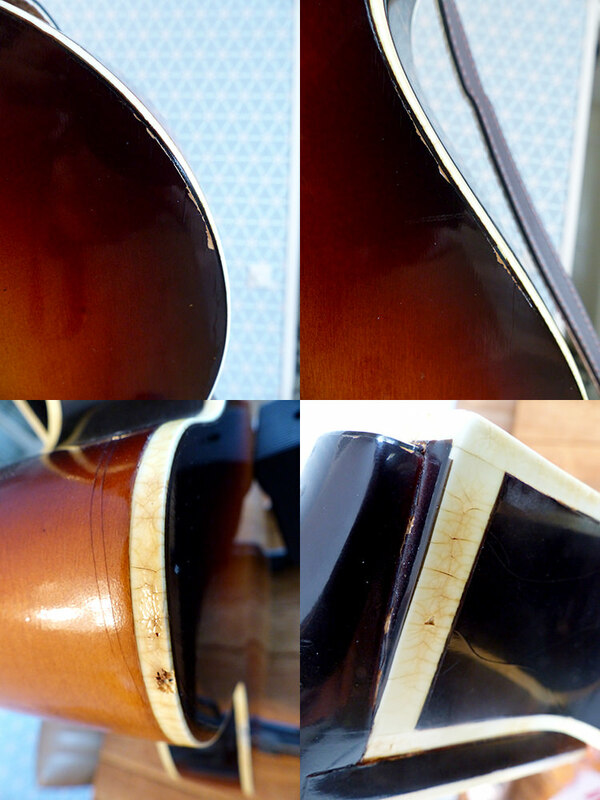 My aul 57/58 Gent had some small cracks when i bought it back in 2000 ,which haven't got any worse,it also had a small bit of separation in the cutaway,it also stank when i took it of storage at the same time as the 6120,but it was just the heel cap . I really hate that smell! I keep these and my 57 6120 out of their cases all the time now. JC, great pics and info. Nice. Like you, I keep mine out of the case all the time. Don’t need to speed up the deterioration by keeping it in the gas chamber, uh, I mean in the case. A Viking I had briefly, bought it on EBay, such a shame, The Rot was all around . Too bad, I liked that Guitar too, especially the “Possum Peter”Bigsby Arm. Norm you had it briefly. Does this mean you sold it because of the binding rot? Nice thread! Here's my '67 Annie. 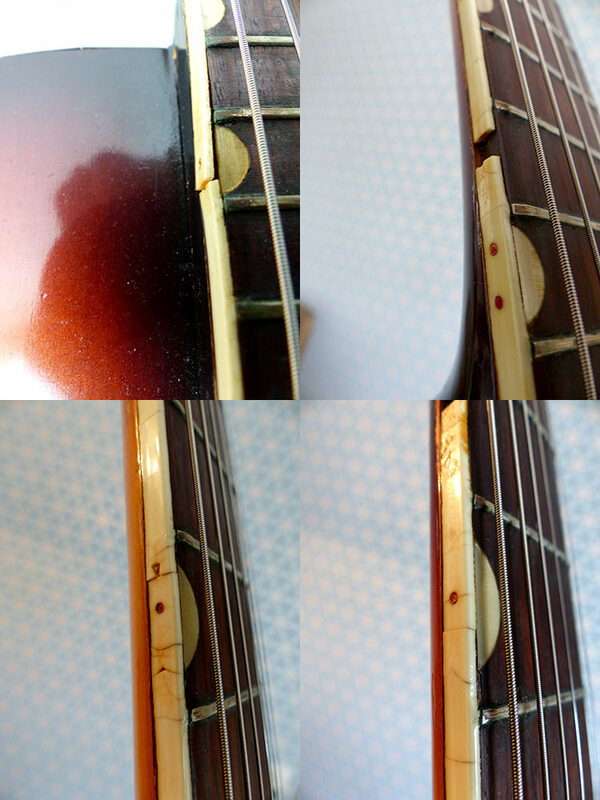 I will be replacing the binding myself when I have some more experience working on guitars. I will also do a refret then. Just out of curiosity, what year was this poor girl, Norm? This one had it bad. I could post about 60 guitars but I'll leave it to one.